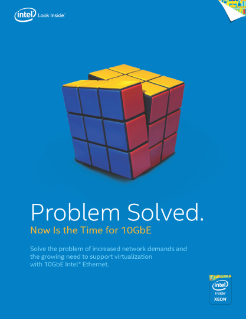 Solve the problem of increased network demands and the growing need to support virtualization with 10 GbE Intel® Ethernet. A recent survey conducted on behalf of Intel shows growing demand among IT professionals for increased network bandwidth and data center flexibility. In addition to this, modern business tools such as virtualization and cloud computing are driving markets to move from ...legacy Gigabit infrastructures to 10 GbE. A deeper dive into the survey results will show that not only are IT managers and staff primed for 10 GbE, but also that the opportunity is ripe to seize the initiative and offer 10 GbE solutions to your customers.